OOOOoooo, I got one! The 1962-64 Chrysler Turbine. I want one! A lot of thought went into that installation. Yes, he likes everything. It was sitting between a McLaren F1 and a Chevy Volt, both of them his. I think Jay is your kind of car collector, he looks for unique and technologically advanced cars for their day. 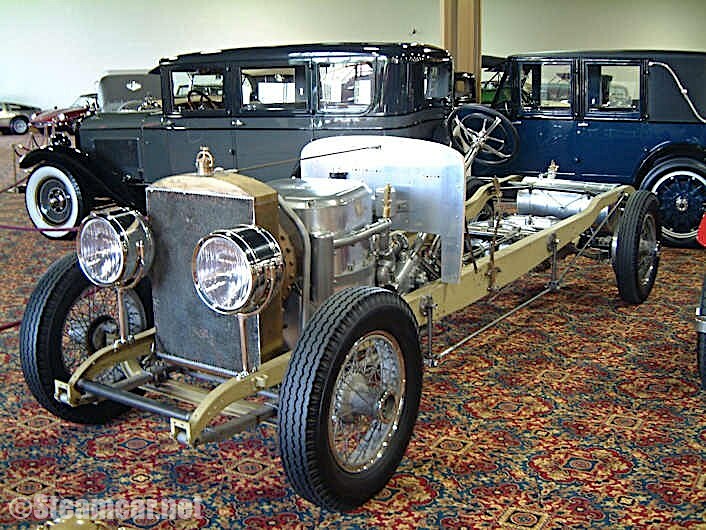 The 1925 Doble Steam Car, probably still the most advanced steam car ever built. There is also his Baker electric car of 1901. Very useable and advanced car for its day. Last edited by wnut; 20 Jan 2018 at 01:28. Glad you enjoyed it Mike. You're right $25000 for a car in 1925 would have been a lot, and no brakes to boot. I think modern brakes are a good idea on vintage cars, Leno does a lot of work with Willwood, and ensures the classics can be returned to original if need be. Jay Leno's Garage has a lot of really unique and interesting cars, and his love and work restoring them is admirable. A worm hole that you can disappear down for hours on end. Jay Leno's Garage- A worm hole that you can disappear down for hours on end. I give you the Gordon Murray Designs T25 and T27. As you'd expect from the man, they seem like really neat cars. Hard to believe from the same hand that drew the McLaren F1 and new TVR..... But my understanding is that the two ‘T’ cars were built to demonstrate Murray’s ‘iStream’ manufacturing process, which I think is still under evaluation by a mainstream car company or two. There was a carbon fibre Yamaha concept designed around it, which was shown at Tokyo Show in 2015. Neither the T25 Petrol or T27 Electric cars have gone into production unfortunately, but there still time for something to come from them.... Not yet dead! How about the Chevy SS, or Holden in Australia. The car was delivered to the U.S. so loaded down in unwanted gadgetry like "skip shift" etc. etc. that it cost $55 000 rather than $30 000 dollars and sank like a stone in the U.S. market for this and a number of other reasons. Trying to out BMW BMW. This goes straight to a major bugbear of mine that modern cars are just too complicated and full of things that cost money require maintenance and need constant and expensive maintenance. Car manufacturers version of GPS has to be the worst, but is closely followed by a whole bunch of expensive trash that adds nothing to a car. Following in from wnut's points one might observe that any car that can be stolen from outside a house without the need for a key or some sort of in car activation device might be considered to be too clever for their own good. Or, as my elder daughter related this evening, her husband was meeting up with someone and heading off to a meeting and she went along to drop him off. Keyless entry and push button start, he drove there, she drove back. He still had the fob in his pocket. The car had not been stopped when they swapped over. There was a spare key (and a spare car) at home. However she had been intending to stop for fuel on the way home but changed her mind. Just as well because absent the fob she would have been stranded at a fuel station, blocking a pump and with a baby in the car. Which story, no doubt not uncommon these days, might suggest that a large number of not very special cars on the roads are too clever for our own good let alone theirs! And all of the electric wizardry, endemic from around 10 years ago in even relatively modest vehicles, is very likely to make something with a body construction capable of lasting around 20 years with average treatment fall foul of engine and other electronics obsolescence (based on cost of spares) well before their main component design life is achieved. So, for example, all of the "carbon" investment in the metal quality and the additional weight and safety components has to be written off because a few bits of electronics, designed to reduce "carbon emissions" allegedly, become obsolete or expensive much earlier in their shorter life cycle. How wasteful can "clever" become? But I think I am digressing from the central concept of Mike's original question. At the risk of drifting off into "Glorious Failures (Commercial)", how about the Maybach of recent times? I might also offer the Fisker that was around, briefly in a few well healed locations, a few years ago. But that was probably more a commercial problem then too clever engineering. That must be our Vauxhall (GM) VXR8 http://www.vauxhall.co.uk/microapps/...8/gallery.html which has the supercharged 600bhp engine. It's imported in very small numbers by the manufacturer, as the previous models have been. (We got the Maloo as well ) Journalists praise it for simplicity and 'old skool' take on performance, like an M5 or AMG without the fancy stuff, so all they import sell. With the end of Holden production in the home country, presumably last of the line.... RIP ! I thought Fisker had gone out of business at least once since they first released something with wheels on tarmac under that name. Wiki seems to support that understanding. Fisker Automotive became Fisker Inc.